The Great Pyramids of Egypt have long interested scholars, travelers, and mystics, all of whom have arrived at their own interpretations of the significance and origins of these magnificent structures. The Arabs call them "Mountains of the Pharaohs." The Middle Ages wrapped them in a dark cloak of mystery, fantasy, and secrecy. What is their secret? Why the shape? The height of the largest pyramid, if multiplied by one billion, equals the distance from Earth to the sun. The side of its base, divided by twice its height, equals the approximate value of pi. What accounts for these coincidences? How is it possible to calculate the dates of all wars and disasters based on the dimensions of the Great Pyramid? Read Pyramids of the Great Architect of the Universe to learn the answers to these and other questions about one of the Seven Wonders of the Ancient World, which still baffles us in today's scientific age. About the author: Petros Petrosyan is a nuclear engineer from Armenia. He is a graduate of Yerevan Engineering University, and is married with two children. 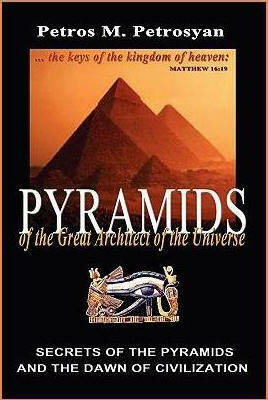 His fascination with the Egyptian pyramids began in 1988, and his study of pyramidology continues through today. Petrosyan is also the author of Pyramids: The Key to the Code of Self-Destruction. was not on this plane. Pyramid architectural parameters are of no importance from a cryptographic point of view. The cipher essence is hidden in the pyramid’s geometric form. 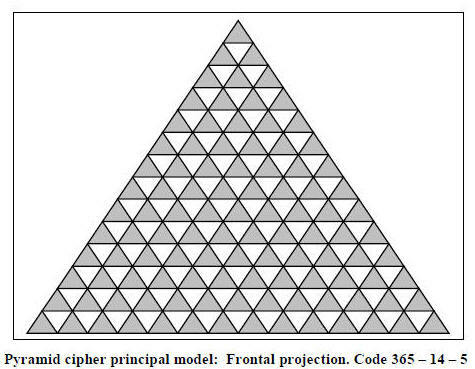 The basic model of the Pyramid cipher was established. 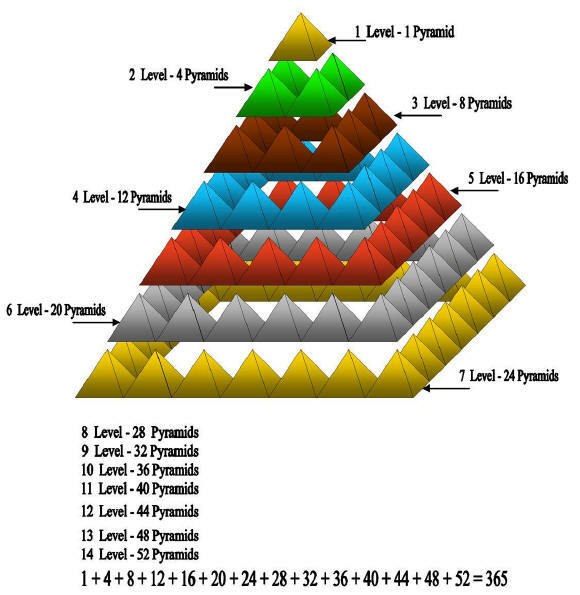 The basic model of the code of a pyramid is formed of 365 small pyramids which consist at 14 steps of model of the code. The numbers 365 and 14 are one of the cryptogram decoding keys. Note: The following is part of the book "Pyramids of the Great Architect of the Universe" by Petros Petrosyan, presented here with permission of the author. None of this content can be copied without permission of the author. 1. Who Built Pyramids in Giza? All year round, people of different professions gather around the pyramids. The largest multitudes are, of course, tourists. Those who have been to Giza once say that the first sight of the pyramids surpasses description and expectation. Pharaoh Snofru’s successor, his son Khufu, or Cheops, as the Greeks used to call him, built a wonderful pyramid in Giza. The initial height of that giant was ≈ 147 meters. Its base, before it lost its outer casing, was ≈ 233 meters on all sides. The sides of this pyramid slope at ≈ 52 degrees. One hundred and twenty-seven years ago, Cheops’ pyramid was the highest construction in the world; only in 1880 was it exceeded by the towers of Koln Cathedral. The second largest pyramid in Giza is Chaphra’s (Chephren) pyramid. Its initial height was ≈ 143.5 meters. The sides of its square base were 215.3 x 215.3 meters. The pyramid sides slope at ≈ 53–54 degrees. Scholars and Egyptologists are not alone in their occupation with the investigation of the pyramids. In 1969, Luis W. Alvarez, winner of the Nobel Prize in physics in 1968, decided to explore Chephren pyramid. “Chephren’s pyramid has not let out its secret up to now; it appears indistinctly in the distance, like the Sphinx at its foot,” states L.W. Alvarez before his experiment. L.W. Alvarez was a professor in a California university. In 1969, with help from an American committee on atomic energy and with support from the Egyptian government, Alvarez set space radiation particle counters in the burial chamber of the pyramid, hoping to take a shadow picture of the pyramid, as in roentgenoscopy, and reveal hidden chambers. It would help discover where the pharaoh’s mummy and treasures were hidden. Everything went according to plan, but the expected vacuums were not discovered. The smallest of the three royal pyramids in Giza belongs to Pharaoh Mycerinus (Menkaure). The sides of its square base are 108.4 x 108.4 meters. The initial height was approximately 66 meters, the angle of its sides ≈ 51 deg. During the fourth dynasty, another pyramid was ordered constructed by King Djedefre, one of the most mysterious persons to sit an Egyptian throne. Opinions differ on whose successor King Djedefre was. Djedefre’s pyramid was the most northern of all the pyramids in Egypt. The sides of its square base were 100 x 100 meters. Its sides go up only ten meters. Very little is left of Djedefre’s pyramid. While pondering the question of who built Giza’s three famous pyramids, we should note that Pharaohs Khufu, Khaphra, and Menkaure were connected to them in Herodot’s records, although their names were not often found in the Giza necropolis. For clarity’s sake, it should be noted that pharaohs’ bodies were never found in the pyramids of the third or fourth dynasties. No signs of royal burial were discovered; some of them did even not have any sarcophagi, as was the case with Huni in Maidum. There was a sarcophagus in Sehemhet’s pyramid in Saqqara, sealed and untouched. Burglars never managed to break in. However, when the sarcophagus was opened, Pharaoh’s mummy was not in it. The reader may ask if it is likely the builders used ten million tons of stone to construct the pyramids in Giza, Dahshur, Maidum, and Saqqara, the only goal of such mighty structures the placing of an empty sarcophagus in an empty tomb. We’d like to suggest another theory, which states that these monuments stood on the plateau of Giza long before the appearance of the civilization. Perhaps Pharaohs Khufu, Khaphra, and Menkaure added only subsidiary constructions to the three great Giza pyramids. Unlikely, but possible. We wouldn’t like to exclude other possibilities. 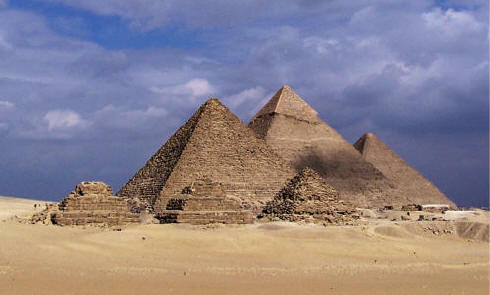 It can hardly influence or clarify the question of the beginnings and purposes of the pyramids. All the same, the evidence regarding who ordered the pyramids built, when, and what their goals were is questionable and gives us no clarity concerning either their beginnings or their predestination. The last lord of the fourth dynasty, Pharaoh Shepseskaf, ordered built a tomb for him in the form of mastaba, “the pharaoh’s mastaba.” The pharaoh’s decision startled his contemporaries, scholars, and Egyptologists. Everybody asked the same questions. Why wasn’t Shepseskaf buried like other representatives of the fourth dynasty? Why wasn’t he buried next to Cheops and Chephren? Why did Shepseskarf choose to place his tomb where neither the pyramids of Giza nor Dahshur could be seen? And finally, why did the king choose a mastaba and not a pyramid? We shall attempt to answer these questions, comparing our viewpoint with the official one. We may assume that his choice of tomb and the place of his burial lie in his desire to differ from his predecessors. But why? We believe that during the struggle for the superiority in religious and ideological harmony, Shepseskaf sided with the priests of the highest echelon, who were against the pharaohs building a geometrically regular pyramid, considering it a blasphemy against the gods. Shepseskaf’s decision to build a mastaba was an abrupt turn backwards, the result of a violent ideological struggle in the highest echelons of the government and religious powers of Egypt, a violent struggle for truth. According to Herodot, Egypt became weak due to the third and fourth dynasties’ pharaohs’ dissipation, egoism, and pyramid building. The majority of the pharaohs of the third and fourth dynasties compared themselves to the sun god, Ra. Almost all the information about the pyramids Herodotus obtained from the priests of the Sais temple while they were in opposition with the pharaohs. Though more than thousand years had passed since the opposition and Herodotus’ appearance in Egypt, the Sais priests must have discredited the names of these rulers because after Pharaoh Snofru, most of the rulers of the fourth dynasty were considered heretics, although Herodot kept silent on the matter. The truth lies in the pharaohs’ apparent confrontation with the priests. During the reign of these kings, the main Egyptian god was the sun god, Ra, especially revered in Heliopolis. Ra’s name was part of the pharaoh’s titles: Khaf-ra, Djedef-ra, and Menkau-ra. Herodotus was initiated into the secret doctrine, belonging to the priest caste, and manifested sharpness towards the above-mentioned pharaohs, as noticed in his records. Not by chance. These pharaoh-heretics were the ones who requested the geometrically regular pyramids, the first to resist the will of the priests and demand the right to build true pyramids. A chaotic state ensues right after Pharaoh Djoser’s reign. Most likely, other pharaohs opposed the priests, but no record of it has been preserved in history. We believe the pharaohs withstood the supremacy of priestly wisdom, and acknowledged them as their teachers. The situation was radically changed with the conquest of Upper Egypt and the unification of the state. Pharaoh, having the title of a highest ranked priest, communicated the mysteries and holy knowledge of the priest caste. In due time, he wanted to combine state and religious power in his hands. The pharaohs no longer wanted to be the pupils. This struggle can be followed throughout the history of Ancient Egypt. Because of such struggles, Egypt was sometimes controlled by dynasties of priest-rulers. Obviously, Pharaoh Shepseskaf sided with the priests, which is why he didn’t build a pyramid. Shepseskaf strived to discredit his predecessors, as if calling the pyramid constructors heretics. This idea is supported by the fact that, right after assuming the throne, King Userkaf ordered a pyramid built for himself, closing all paths leading back to the old. Now we would like to talk about one of the more compelling mysteries of the pyramids—their exact astronomical orientation. From different sources, we know that pyramids are oriented towards the cardinal points. Except for isolated pyramids, including Djoser and Sahure, the deviations of the south-north axis don’t exceed one degree. Ancient Egyptians deliberately oriented pyramids with the cardinal points, and somehow, they had the knowledge and skill to achieve exact orientation. Religious beliefs held that the spirit of the king, after his death, soared to the skies, to the stars, where he occupied the place over the North Pole. In accordance with this, all entrances in the pyramids of the Old Kingdom face north. Clearly, Ancient Egyptians were aware of celestial objects and their patterns, if they were able to use them to orient their monuments. One of the latest hypotheses to attempt to solve the problem is based on a 1993 discovery made proving that the Giza necropolis had been built according to a plan demanding the exact orientation of the three pyramids, not only to each other, but to the river Nile, modeling on a huge scale the celestial phenomenon. 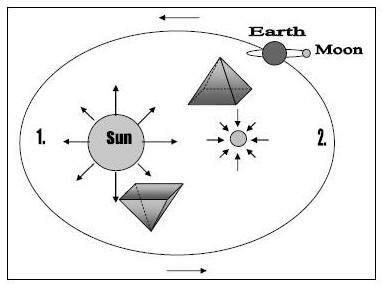 Some explorers believe the abovementioned hypothesis is able to explain not only the reason behind the astronomical orientation, but also what we consider more surprising—the fundamental arguments on which builders determined the size of each pyramid. 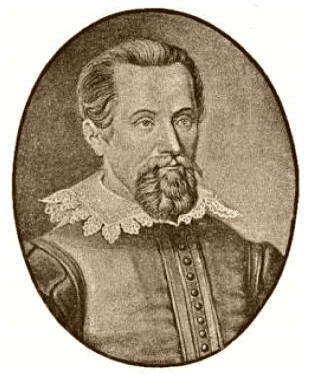 The author of this discovery was Robert Bauval, a Belgian engineer and builder. 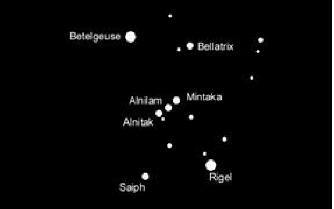 Bauval discovered that the moment the stars forming part of Orion cross the Giza meridian, they are arranged in the southern sky almost along a straight line, but only almost. Two lower stars, Alnitak and Alnilam, make a perfect square diagonal, while the third star, Mintaka, is displaced to the left of the observer, i.e. to the east. Bauval thought that on the plan of the Giza necropolis, the Great Pyramid of Cheops corresponded to the position of Alnitak. The Chepren pyramid corresponds to the position of Alnilam, and Mikerin’s pyramid, displaced to the east, corresponds to the position of Mintaka. Here, Bauval sees a diagram of that part of the sky, which corresponds to Orion. In Bauval’s opinion, the three pyramids belonging to the fourth dynasty pharaohs of ancient Egypt in reality are a map of thee stars of Orion, not only their mutual disposition, but in their relative dimensions they characterize the size of the star. According to the Belgian engineer, pyramids and other monuments of the Giza necropolis are situated in such a way that they form the starlit sky of 10450 B.C., but not the map corresponding to the fourth dynasty, about 2500 B.C. The starlit sky is not constant. It changes all the time because of the equinox precession. Thus, we may conclude that the three Giza pyramids were built not by fourth dynasty rulers, but by persons unknown, and that during the reign of Cheops, Chephren, and Mikerin, they had already been standing on the Giza Plateau for almost 8000 years. In spite of the originality of this hypothesis, it has some holes: if we admit that the three Giza pyramids reflect the part of the sky corresponding to the three stars of Orion, what is reflected by the disposition of pyramids in Saqqara or Abusir, or the rest of the stars forming the part of Orion constellation? It is natural to suppose that ancient Egyptians assigned roles to these three stars. And what about the rest? Is it likely they built some of pyramids to reflect celestial realities and others without any plan? It is doubtful. One shouldn’t see the purpose of pyramid as based solely upon its geometric dimensions. Nor should one assume that the Giza pyramids are more important than are any others simply because two of the largest examples make their home on the plateau. 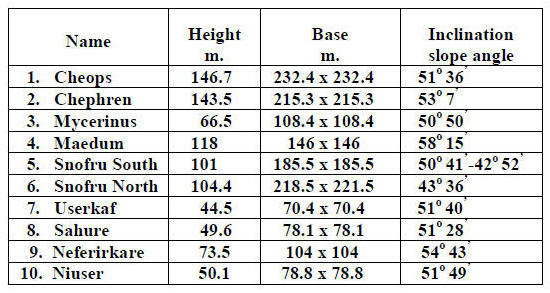 The size of these monuments have place in the investigation of their building or of the purpose of the pyramids. As an example, we have three lines. In one line, we’ll arrange three pyramids of different sizes; in another line, three A’s, again of different sizes; and in the third, three figure 2’s. 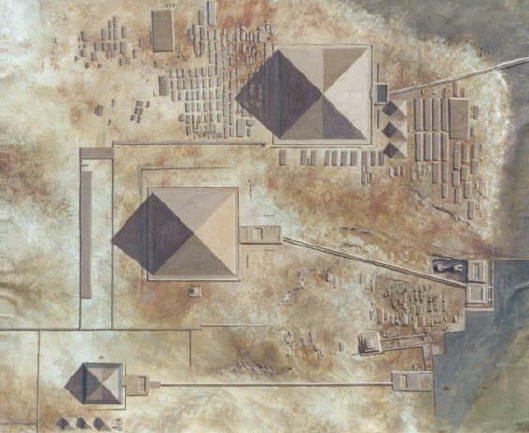 The existence of dozens of pyramids in Egypt, each differing from the others in its geometric design demonstrates that the size of the pyramid does not play an essential role in the issue. 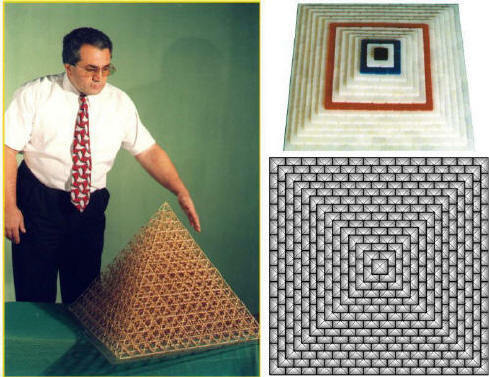 If three different persons are shown pictures of three geometrically correct pyramids of different sizes and asked to share their impressions, one can be sure that the three have still seen geometrically correct pyramids, independent of their sizes. 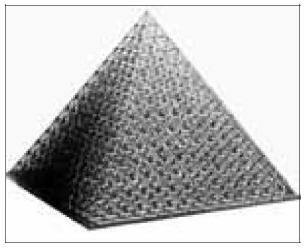 For the majority of our readers, the essence of the secret may be discovered using factual peculiarities arising from the geometric form of the pyramid. Many mysteries connected with the pyramids are still under the pressure of orthodox Egyptology. While official science is right and logical in many aspects, there exist problems that require a different approach. Charles T. Russel was the founder of the Society of the Watch Tower. Pastor Russel stated that Egyptian pyramids held divine prophetic secrets known only to him. 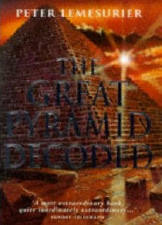 Only by studying his books could everybody understand the divine secrets of the pyramid. He considered his doctrine inspired by God, but of terrestrial origin. Pyramidologists used complicated measurements to uncover hidden secrets of the pyramids, trying to connect those measurements with events in Christianity. That day Jehovah will display himself as a Great Savior, and he has already assigned the pyramid part of the work to convince the world in his wisdom and providence. It will be an additional confirming evidence of the Great Pyramid to God’s written word; it will be a new reason for the rejoicing of true believers. The testimonies of that witness will present humankind new, fresher grounds for the strengthening of faith. That stone “witness” preserved by a thousand-year silence must speak at last. The true believers are privileged by seeing and hearing the testimonies of that stone witness before the secular (mundane) opinion are ready to evaluate it. We can’t doubt that this ancient structure was repeatedly mentioned in the Holy Scripture as “God’s witness on the land of Egypt.” Only when we entered the time named in Daniel’s prophecy, “the time of the End,” when knowledge shall be increased and the wise shall understand God’s plan (Daniel 12:4, 9, 10), will the Great Pyramid’s secrets become comprehensible; only then will all the questions get a reasonable answer. There is a greater idea embodied in that splendid structure. Of his five points, there is the one in which all his sides and outside lines are completed. This is the corner of the summit meeting that raises his solemn forefinger to the sun. Practically, the king of fame has arrived and the overwhelming majority of true believers must rejoice. Every inch of that massive structure eloquently announces the wisdom, strength, and elegance of our Lord. The testimony of that witness, like God’s written word, will point out with solemn and faultless exactness the final destruction of the old order of things on the earth. In 1922, Borchardt wrote “The Great Pyramid, to which all these theories based on numbers and dimensions refer, contains no mystery at all. Among many of the kind, it is one of the sepulchers and is no different from others. Even the dimensions of that pyramid can’t serve as a basis for distinguishing it among others as is constantly being done.” This explanation is logical, acceptable, and convincing in is clearness. John Taylor, the author of the 1859 book The Great Pyramid: Why Was It Built and Who Built It? is considered the founder of pyramidology. He asserts that the level of mathematical, astronomical, and architectural knowledge was so low that human beings could not have built it and “thus it follows that inevitably God must have helped them by inspiring them with all his knowledge.” He had never visited Egypt, and he was neither an Egyptologist nor an engineer, just a retired publisher. However, in the atmosphere of British Israelism, his theory flourished. Numerous articles have been written disproving pyramidology and the idea that the Great Pyramid was constructed under the mystic guidance of God, but many people continue to believe that the Great Pyramid is evidence of God embodied in stone and refer to the Bible where, they claim the pyramid is mentioned as God’s evidence. 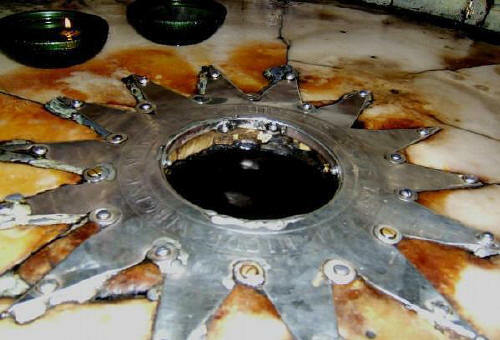 In Isaiah19:19-20, the following is written: “In that day shall there be an altar to the LORD in the midst of the land of Egypt, and a pillar at the border thereof to the LORD, And it shall be for a sign and for a witness unto the LORD of hosts in the land of Egypt.” Many people still believe that the Great Pyramid was built according to a plan inspired by God. Was the pyramid really constructed under the guidance of God? To answer the question, we must consider all arguments. The old wisdom reads, “Ideas are worthless if they can’t be verified and supported by confirming evidence.” But until the true purpose of the pyramids is proven, opinions will differ. Taylor’s theory became attractive after Charles Piazzi Smith, the Royal astronomer, paid attention to it. Smith’s natural originality, Scottish Puritanism, and his desire to find ties between Great Britain and the Bible caused him to fully accept Taylor’s theory. His book, Our Heritage in the Great Pyramid, became very popular. However, Taylor’s theory was disproved unexpectedly. A formerly devoted student of Smith’s went to Egypt in 1880–1882 to record exact measurements that would help him support Egyptology. According to Egyptologist Mendelson’s conclusion, “He made a brilliant and exclusively precise triangulation (dividing into triangles) of the Giza area, which showed Smith’s measurements as incorrect and that there was no ground to support his theory.” This young man was Mathew Flinders Petry, and he later became a prominent Egyptologist. The weakest point of Taylor’s theory is that he bases it only on the pyramid of Cheops. Taylor’s theory treated other pyramids as though they did not exist. Egyptologists couldn’t agree with that. The pyramid of Chephren is only a few meters shorter than that of Cheops. Constructed on higher ground, the pyramid of Chephren looks a little taller than the pyramid of Cheops. 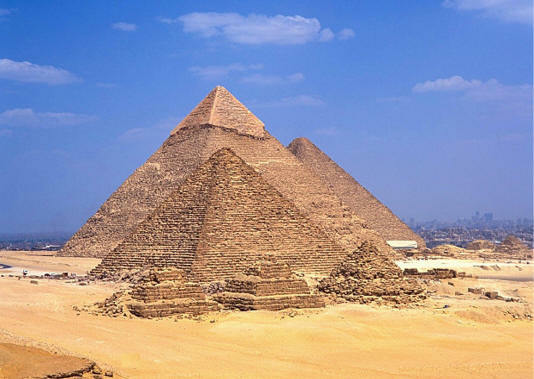 Archeological investigations have proved that the Great Pyramid is only the sepulcher of Pharaoh Cheops. Some don’t agree. According to Egyptologists, the Great Pyramid had always imbued reasoning people to generate all kinds of theories, but academic Egyptology believes Taylor had the right to formulate his own hypothesis. Many researchers think otherwise. Taylor wrote, “God had presented and materialized in it fundamentals of mathematical and geometric knowledge to preserve them for the ages for those able to understand and make use of them.” Taylor’s main task while studying pyramids was to determine the units of measurement used by their constructors. We think he made a mistake. The majority of Taylor’s followers left the grounds of Christian religion, though not the Bible. Some pyramidologists called the Great Pyramid “a stone Bible,” where you could read all wisdom—the past and future of humankind. You have just to be able to read it. But how? Some preferred the mathematical approach, others the mystical one. Many never revealed the method of their research and concealed from the world even the results of their investigations. J.R. Skinner was convinced that the Great Pyramid’s dimensions expressed the ancient wisdom found in old Jewish texts. Skinner’s book, Key to the Hebrew-Egyptian Mystery of Measure Source was published in 1894. One of Taylor’s followers was Scotch royal astronomer Ch. P. Smith, born in 1819, in Naples. His father was a British admiral. In 1845, he was became an Edinburgh University professor, and in 1854 he became a member of the Royal Society, but after twenty years, he renounced the title because the Royal Society refused to support his interpretation of the Great Pyramid. He wrote, “Of course it was not a sepulcher; it was a mysterious measures and weights compendium inspired by God and…All the knowledge disclosed to the mankind by God. One has simply to correctly interpret the secrets of the pyramid, though not with the help of certain abstract speculations, but with the help of mathematics.” We believe Smith was right. Noetling, a German war prisoner, after becoming acquainted with Smith’s works in Australia, in 1921 published a book entitled Space Figures of Cheops Pyramid: a Mathematical Key to Single Laws of the Universe. He was attempting to prove that if using the Egyptian cubit, the side of the pyramid will equal “the most exact duration of the solar year.” Noetling calculated the atomic mass of separate chemical elements known to Egyptians and found them encoded in the Great Pyramid. D. Davidson discovered the “displacement factor,” with which he could calculate whatever he liked. 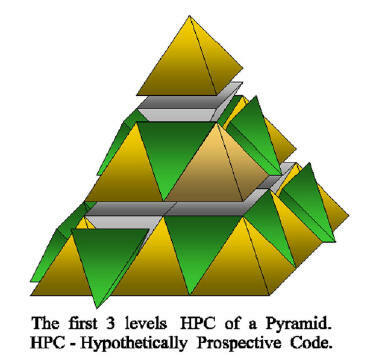 The overwhelming majority of pyramidologists, in attempting to solve the pyramid mysteries, frequently applied all kinds of mathematical interpretations connected with the geometric parameters of the Great Pyramid. Each time, they appeared further away from the real solution. Representatives of mysticism were united by the common conviction that the pyramid could not have been a sepulcher. As representatives of science confirm, almost all the pyramidologists treat Egyptology and its data with contempt. 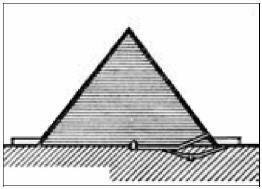 The great majority of pyramidologists mention only one pyramid—the Great Pyramid of Giza. Explorers vary in opinions, but over the last two hundred years, Egyptologists and archeologists have done a great deal of work and the knowledge at their disposal is indisputable and subject to thorough research. Exploration of this knowledge will enable us to restore the scenery of different epochs and social-cultural development of Egypt. With the help of Egyptology, we’ll be able to follow the religious path followed by Egyptians in different epochs, as well. Now an attempt will be made to unite these two points of view. The numerous new theories and judgments about the true purpose of pyramids are necessary to consider. Only the study of these theories will give any estimation of the material. Initiators of all theories were convinced that Pharaoh Cheops’ pyramid could not have been a mere sepulcher, and an overwhelming majority of them, based on their own measures, interpretations, and comments, lift the mysterious veil of the Great Pyramid. However, some researchers believe that the mystery is hidden in the pyramid’s geometric form. Without giving evidence in support of their versions, they were content with interpretations of philosophical character. J. Barbarain, in his work The Mystery of the Great Pyramid and the End of Adam’s World (1935) suggests, “Outer contours of the Great Pyramid express the main formula of the universe.” H.P. Blavatsky arrived at almost the same conclusion, but like Barbarain, was content with interpretations of the same character: “In its outer forms, the Great Pyramid symbolizes the principles underlying natural creation, simultaneously illustrating the principles of geometry, mathematics, astrology, and astronomy.” We are convinced that had researchers supported their suggestions with concrete argument and facts, orthodox science would be convinced. The weakest point of pyramidologists is the lack of material arguments. And even if they exist, they are not convincing. The absence of arguments converts suggestions into beautiful-sounding sets of ideas that do not influence official beliefs. Neither the representatives of Egyptology nor those of science are able to refute or confirm statements and conclusions. In consequence, when coming across a similar idea, scientists just smile and ignore it. Cyril of Alexandria (fourth century AD) regarded the Egyptian god Thoth as the first of those confessing Holy Trinity. Some explorers maintain that Thoth came to Egypt immediately after Atlantis perished. Plato mentions the disaster in the year 9700 BC. Thoth is considered the inventor of the Egyptian alphabet, after which he was worshipped as the god of writing. During his lifetime, he was revered as an unsurpassed philosopher, orator, athlete, and musician. He acquainted Egyptians with physics, mathematics, alchemy (Hermetics), and astrology. Hermes lengthened the calendar sun year from 360 to 365 days. For these and other reasons, he was called “Trismegistus,” which meant “thrice greatest.” His works underlay Egyptian mysteries and laid a foundation for Hermeticism in honor of the first teacher, sent by God himself. After his death, his doctrine was called Hermetical, and acquired magic force. We assume that the construction of pyramids in Egypt is most probably connected with Hermes, he being God’s envoy, able to pass from Atlantians to Egyptians the most important achievements of their civilization. During cataclysms, when even the mere existence of life is under suspicion, people attempt to preserve for posterity only the most essential knowledge, believing that everything else could be relearned. Hermes brought to Egyptians the knowledge, which became the purpose of the secret doctrine and the pyramids. They were obviously trying to warn us about the threat of civilization destruction, hidden in the pyramid cipher. They realized that only after thousands of years would man’s descendents again come to understand the essence of the pyramids. And the Eastern genius revives in love. Interpreters are convinced it means that at the end of the twentieth century, mankind will understand Hermes’ secret doctrine and a thousand-year-old secret will become a reality. constructed primarily as a temple and only secondly as a pharaoh’s sepulcher. The pyramid’s secret is sooner connected with dimension than form. We continued the search for the secret by investigating peculiarities of the pyramid’s geometric form. The logical conclusion of the comparative analysis can be that all these objects are pyramids. The Cheops pyramid, indeed a world wonder—imagine that you are standing at its foot. It is 146.7 meters tall, and its base sides are 232.4 meters. One hundred and twenty-seven years ago, it was the highest erection in the world. Its volume is 2,641,100 cubic meters. About 2,400,000 stone blocks were used for its construction. Its total weight is estimated at 6,500,000-7,000,000 tons. What does all of this have to do with our questions? We assert that the only reason pyramid form has such value is because a proportional change of a pyramid’s geometric parameters doesn’t change the definition of the given figure. The existence of 73 different pyramids in Egypt gave impetus to the idea that to carry out an effective analysis of these structures we must group them first according to form similarity and then according to dimensional differences. Meanwhile, we’ll regard only geometrically correct pyramid, those with a square base and equilateral triangle sides. 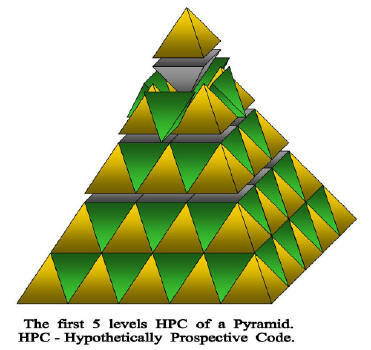 In works connected with the hypothetical cipher of the pyramid, we have used thousands of identical, correct, small pyramids. The discovery of the cipher is of principal importance, because without it, deciphering loses its concrete basis. After many different arrangements of these pyramids, we concentrated our attention on the model of the pyramid formed of fourteen steps. Later, it will be possible to observe that the sum of small pyramids (contained in all 14 steps), which constitute the sides of the Great Pyramid equals 365. The number 365 is one of the keys for deciphering the coded information. Based on the results of our research, we concluded that the fourteen-step model of the pyramid is a principal copy of the mathematical cryptogram, lost by humanity during the last universal catastrophe. Based on Biblical information, we established that Noah’s flood was the eighth and last world catastrophe (see 2 Peter 2:5). It is written that Noah lived in the eighth world. Our civilization is the ninth. Why, from numerous versions, have we chosen the 14-step pyramid model? We dug through thousands of pages of literature in the hopes of finding something useful for our work. We looked for corresponding information with great patience and our efforts were not in vain. Our attention was attracted by the Vasilidian doctrine (one of the Gnostic sects of Vasilid in Syria, second c. AD). Abraksas was the highest ruler of the heavens. In the Vasilidian system, the sum of numerical meanings of letters contained in the word Abraksas is 365 (the sum of seven Greek letters, Abraxaz: 1+2+100+1+60+1+200 = 365). As we know, a year consists of 365 days. In Genesis 5:23-24 it is said that Enoch, son of Jared, lived 365 years and God took him. Among the holy and divine numbers, the figure 14 (2 x 7) is the most common. The number 14 is represented as a total expression of terrestrial and celestial mythological personages. Remember the words of evangelist St. Matthew that all the generations from Abraham until David are fourteen generations, and from David until the carrying away into Babylon are fourteen generations, and from the carrying away into Babylon unto Christ are fourteen generations. In ancient Egyptian legends, it is said that Osiris, after being killed, was dismembered into fourteen parts. According to Egyptian doctrine, the goddess of nature, Maat, formed the seasons. At that time, the solar year was equal to the lunar, both having twelve months or 360 days. Ra, infuriated with the goddess of heaven, Nut, cursed all 360 days of the solar year. Nut would stay sterile all her life. But the god of reason, Thoth, helped her. He cheated the lunar goddess, taking five days from her and devoting them to Ra. Nut gave birth to five children. The first was Osiris (Light or Spirit), who enlightened the universe. The second was Gor (boundary between the body and the soul). The third became Seth (Tifon, or Ignorance, or what is lower than the soul in Greek). The fourth child was Goddess Isida (Knowledge), and the fifth was Neftida (Victory). Some time later, Seth decided to kill Osiris, Ignorance trying to deprive the planet of light by hiding its source light in a sarcophagus. By that time, Osiris had ruled for over twenty-eight years. In the twenty-ninth year, water covered his coffin. Later on, Isida learned about the coffin but Seth took out Osiris’ body, dismembered it into fourteen parts, and threw of the parts across Egypt. This explains the existence of fourteen Mausoleums of Osiris in fourteen cities of ancient Egypt. Under Pharaoh Amenophis XIV (1419–1400 BC), a religious revolution occurred, and the god of the sun, Atun, became god of all Egypt. The pharaoh changed his name from Amenhotep (Amun is glad) to Akhenaten (useful for Atun) and became the supreme priest of the Atun cult. 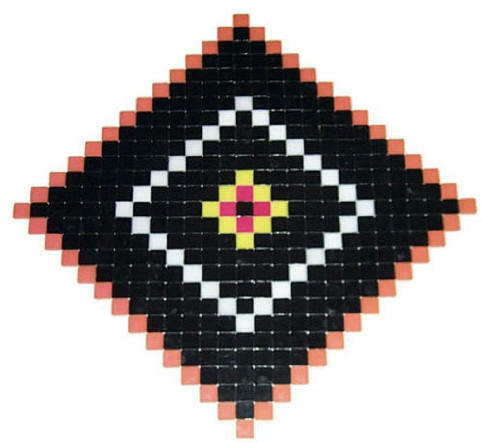 Atun was represented in the form of the sun disc with fourteen rays. At the end of these rays were hands holding the ankh (symbolizing that Atun gave life). In ancient Eastern countries, the number fourteen is considered a numerical expression of space and time. According to Jainism, the total height of the upper and lower worlds equals fourteen Radge. One day of Brahman (one Calpa) consists of (fourteen Manvantars), or fourteen Manu epochs. There is evidence that ancient peoples developed extensive knowledge in several fields. Many achievements of that time are not clearly understood even now. Modern man is struck by structures such as Stonehenge, Mesoamerican and Egyptian pyramids, the Easter Island statues, and many other objects, including the Shri-Yantra. The central object of the Shri-Yantra is a fourteen-point star. Each element of the picture is connected to an aspect of cosmology. At present, Shri-Yantra is considered a ritual composition. The Biblical story of the Flood has Noah and his family spending 365 days in the ark. God ordered Noah to take seven pairs of animals and birds to the arc, which when multiplied, equals fourteen. Here again, we come across the numbers 365 and 14, which can’t be explained by coincidence. According to one of mythological versions of the Dogons (Africa), the world belongs to fourteen Ammans, who rule over fourteen vertically constructed countries, seven of which are situated above and seven underneath. In the framework of the Buddhist philosophy, fourteen is the expression of divine wisdom. Reandzi, a Buddhist temple in Kioto belonging to the Rindzai sect, was built in 1450 and became a refuge for monks practicing Zen Buddhism. Since the end of the eighteenth century, the temple has been on the decline. Many structures have been destroyed by fire. At present, the fame of the temple is exclusively due to a garden of stones in one of the wonderful philosophical gardens, supposed created by Master Soami. What do these stones personify? One of the enigmas of the garden is that, independent of where on the verandah you look, you will always see fourteen stones. Perhaps Soami was trying to show the people the infinity of the world, the strength of space, and the majesty of Buddha, to make them understand that there is much that is incomprehensible in this world. The residence of the spiritual leader of Tibet, the Dalai Lama XIV, is in Dharamsala. The number fourteen is the index number of Avalokiteshvara’s incarnations, through him personified. All of Apostle Paul’s messages make up the number fourteen and the sum of Jewish letters in David’s name equals fourteen. Jesus Christ’s star of Bethlehem was a fourteen-pointed star. “God has created the human from 360 parts, Also he has given him five sense organs." Then he writes that God added to the number of components the number of senses, resulting in the number 365—the number of days in a year. He also states that the secret of man’s creation can be revealed via a monument that includes the component of time and constitutes the number of days of a year. We know that there are 365 days in a year. After fully analyzing these lines, we concluded that here, too, the monument could be the pyramid. These and other facts played a role in the final choice of the fourteen-step model of the pyramid as the prototype for the cipher lost during the Flood. Further research acknowledges the correctness of our choice, demonstrating that Bible is one of the pivotal links in the chain of encoded information, thus being simultaneously the cipher and the key to the cipher. Research of mathematical models and deciphering keys has led us to our conclusions. Kepler’s first law states that all planets revolve around the sun in an elliptical orbit with the sun at one of its focuses. The energy radiated from the sun is formed by thermonuclear synthesis, resulting in the formation of one atom of helium (He24) from four atoms of hydrogen (H11). Helium is four times heavier than hydrogen. Kepler’s law raises a question. What is the other focus of a planet’s elliptical orbit? Man always fixed his eyes on the sun, the moon, and the stars; there is nothing extraordinary about this. Many nations worshipped the sun. In ancient Egypt, the god for the sun was called Kheprer, for “rising sun,” and Ra, for “setting sun” –Atum. The nine-god system, born in Heliopolis (On), was headed by Atum, the sun god and creator of life. According to Akhenaten, Aten was the supreme god. In the course of time, the sun god Ra, Atum, and Aten merged into one deity. In the process of mathematical cryptography research, we concluded that the energy absorbed by the second focus of the planet’s elliptical orbit is information. Through synthesis in the second focus, one atom of helium (He24) forms four atoms of hydrogen (H11), which is four times lighter than helium. Thermonuclear synthesis radiates thermal and radioactive energy, but the second synthesis absorbs energy, and is neither thermal nor radioactive. It is assumed that the second synthesis absorbs the information separated from the physical bodies after the death of a biological object, retaining their life experience so that it is never lost. Any living subject can be considered to contain information. There should be an information conservation law, which can be expressed by a corresponding formula. We would like to say, that information, the volume of which is hard to indicate, is encoded in the image of the fourteen-step pyramid. The carriers of the information are the geometric compositions, formed by the small pyramids. The geometric compositions can be plane (2D) or volumetric (3D). Each of the informational layers has a geometric composition and a numerical key for the given composition. And the language to decipher the cryptogram is mathematical logics. 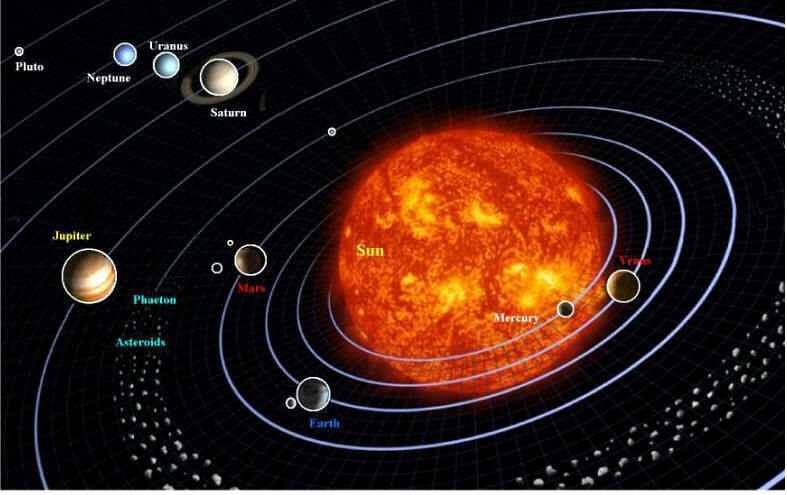 The energy absorbed by the second focus of the elliptical orbit of the planets differs qualitatively from that radiated by the sun. That is why the human eye cannot see the second focus. Perhaps a man starts perceiving the second focus of the elliptical orbit of the planets only after death. The human body dies, but what perceives the second focus does not. G. Narekatsi states in The Book of Tragedies that a man is not a body; the body is a feeling, accepting vessel of man. If after the death of a man, something continues to exist and fixes a reality not available to living people, we do admit that it may be a human soul? It is said that the soul is immortal. When the body dies, what separates from the human body? If the soul, what does it consist of and what it is like? We think life experience separates from one’s his body after death. In the course of time, man understood that energy does not get lost; it just transforms. This resulted in the creation of the law of conservation of energy. This law of physics has gained empirical confirmation. Man understood, too, that substance does not get lost, either; it transforms from one state to another. This resulted in the substance conservation law, also empirically confirmed. The given reality of the world can be correctly evaluated by its informative value. The principle is as follows: more information = more experience. The universal experience of mankind is just a simple component of the divine experience. The day when the existence of afterworld is accepted is close enough. When God distributed the seeds of life, he planned how to recollect souls so that nothing was lost. The immortality of the human soul may be substantiated or explained within the framework of the information conservation law. After all, our life is the vessel that carries out the process and exchange of information. From that perspective, our life, the processes in society, and the phenomena in the surrounding world should be considered. The result of every life is the information or experience gained. If we accepted the existence of the information conservation law, the phenomenon of the human soul could be understood. The immortality of the human soul may be explained only in the framework of information, or life-experience conservation. The time when these thoughts will find confirmation is near. Based on information from the Holy Bible, we have established that God created the universe, including Adam the Man, and with exactness determined the period of time during which human kind must exist on this planet. To determine that period, we must study the following items. 2 Peter 3:8: “But beloved be not ignorant of this one thing that one day is with the Lord as a thousand years, and a thousand years as one day.” Genesis 6:3: “And said the Lord my spirit shall not always strive with man for that he also is flesh: yet his days shall be a hundred and twenty years.” Here God determined the period of existence of human kind on the earth. So how many days are there in 120 years? It won’t be difficult to calculate, for we know that one year = 365 days. 120 x 365 = 43800 days. God allotted man 43800 days. However, we must remember that these are divine days. Taking into consideration 2 Peter 3:8, “that one day is with the Lord as a thousand years,” one day =1000 years, It is not difficult to guess that 43800 x 1000 = 43,800,000 years. God allotted humankind 43,800,000 years of existence. See the Koran 22:46. Here again it is affirmed that one day = 1000 years. According to academic science, man appeared on the earth about 40 - 50 million years ago. But things are not as simple as they may seem at first sight. Based on the above facts the second advent of Jesus Christ will take place at the end of the twentieth and beginning of the twenty-first century. Jesus said that on the third day of his crucifixion, he would rise from the dead. As true believers know, it really happened like that. Taking into consideration 2 Peter 3:8, “that one day is with the Lord as a thousand years,” we appear to be right in the following: Jesus was crucified on Friday, and resurrected on Sunday. The time between the crucifixion and the resurrection fluctuates from 46 - 48 hours, but the real space of time between the crucifixion and the resurrection makes two days or a bit less. Two days = 2000 years or a bit less. The Christian world will first hear and then see Jesus Christ. Just as in the Gospel, first they heard John the Baptist then saw Jesus Christ. The twenty-first century will witness that happy encounter. All these events will occur in the third millennium, or on the third day after Crucifixion of Jesus. Those from people who need to understand and estimate correctly Jesus Christ mission, it is necessary to study Joseph's figure of son Jacob attentively.After all Jesus in memory of people remained as Joseph's son.Joseph's history of son Jacob slightly opens true mission Jesus universal . Joseph's history can help to estimate correctly to us and a course of historical events before and after Jesus.Joseph's history opens a historical role and universal mission the Jewish people. The Great Pyramids of Egypt have long interested scholars, travelers, and mystics, all of whom have arrived at their own interpretations of the significance and origins of these magnificent structures. The Arabs call them "Mountains of the Pharaohs." The Middle Ages wrapped them in a dark cloak of mystery, fantasy, and secrecy. What is their secret? Why the shape? The height of the largest pyramid, if multiplied by one billion, equals the distance from Earth to the sun. The side of its base, divided by twice its height, equals the approximate value of pi. What accounts for these coincidences? How is it possible to calculate the dates of all wars and disasters based on the dimensions of the Great Pyramid? Read The Pyramids of the Great Architect of the Universe to learn the answers to these and other questions about one of the Seven Wonders of the Ancient World, which still baffles us in today's scientific age. About the author: Petros Petrosyan is a nuclear engineer from Armenia. He is a graduate of Yerevan Engineering University, and is married with two children. 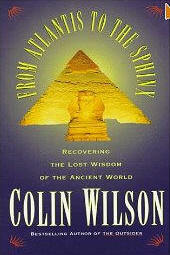 His fascination with the Egyptian pyramids began in 1988, and his study of pyramidology continues through today. Petrosyan is also the author of Pyramids: The Key to the Code of Self-Destruction. A Link between Egypt and Americas? For over 40 centuries, the Great Pyramid of Giza has baffled mankind as to its purpose. This book suggests that the design of the pyramid derives from a simple number code. When the pyramid is "decoded", the message that unfolds seems to be a blueprint for mankind that can be compared with the more recent prophecies of St Malachy, Nostradamus, Edgar Cayce and others. The author has also uncovered links between the pyramid's picture of Man's place in the universe and the religious traditions of Egypt, Palestine, India, and even Central America. This is the book that I've been looking for for a long time! It describes the measurements of the Pyramid of Giza and decodes them, with explanations of them too. The result -- prophecies! It's up to you to believe them or not. It will change your view on the Pyramids, Egyptians, and everything else. A remarkable and must-read book. The author of numerous books with a New Age bent, including the best-selling The Outsider, Wilson here presents an unusual thesis: an ancient civilization, popularly called Atlantis, transmitted its advanced culture to other ancient civilizations before disappearing in a worldwide catastrophe. He examines antique maps, documents, archaeological records, and historical writings to "prove" that humankind is older than frequently supposed and that Atlanteans were the precursors of Egyptians, Aztecs, and Maya. Wilson also posits the existence of a collective human consciousness that permitted ancient peoples to work smoothly with other members of their groups. His most interesting (and believable) statement is that the Sphinx shows signs of water damage, an indication that it is much older than "experts" say. This volume, which bears comparison to John West's Serpent in the Sky (1979), presents its theories in a sober and readable manner. Suitable for public libraries. ?Norman Malwitz, Queens Borough P.L., Jamaica, N.Y. Copyright 1997 Reed Business Information, Inc.